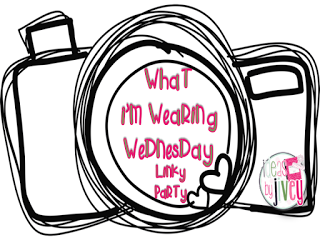 I can't believe I am typing this but I am.....I am linking up with Jivey today for her linky, What I'm Wearing Wednesday!!! 1. I am a plus size gal. 2. I hate shopping for clothes (see above). 3. I hate having my picture taken (see above). 4. I am a horrible blogger with good intentions to blog!! One of our favorite summer activities is heading to the beach. We love Lake Huron and try to get there as often as possible. This summer I needed some new swimwear. I picked up this new tank and I love it. it really does work. It helps create a nice silhouette. The scrunching also helps the top stay down in the water! well when you are sitting on your beach chair, talking to one of your best friends, who is also a teacher, who you haven't seen since March.....well you end up with some wonky tan/burn lines. Yes I ended up with a large triangle of summer color on ONE thigh. After our trip to the beach I spent 3 days wearing this t-shirt, while my car wore this sign. The t-shirt was a boxy, unisex, unflattering shirt....but it meant that I was a volunteer at a music festival!! This was my first time volunteering and I LOVED it. My first duties were at the "Breaking Zombies" event with live music and a zombie walk. I did not get to be a zombie but I did get to see a wide range of zombies, some people went all out. I am a fan of people watching and a zombie walk is a great place to do it. If your city ever hosts a zombie walk I highly recommend attending. Here are a few pics of the zombies (I guess I should say they are graphic, but you all know it is just make-up and not real zombies, but just in case, I guess they are graphic). unfortunately Chris Cornell did not spot me in the crowd and ask me to join the tour....but it was a great show nonetheless. Any takers.....or is it a party of one. So if you made it this far, be sure to check out Jivey's post and linky for some real fashion ideas!! LOL you had me cracking up the whole time! I love those suits, and I am super jealous of your VIP status at the music festival! How does one volunteer for such events?? Jane's Addiction and Soundgarden--wow--I'd love to go to that show. If you can't tell, I'm not a shopping guru either..I know, but surprise. Have you looked into StitchFix. I ended up getting that for my wife (it delivers clothes tailored specifically for yourself and likes/dislikes. So far it has worked out really well...I think she's hooked. I can be in your tribe and then it will be a party of two and we can eat as much movie-theater popcorn as we want! What shall we name our tribe? P.S. I tried Gwynnie Bee...the stitch fix for over a size 10...except you pick out the clothes yourself and you rent them....send back or buy are the options. Everything fit me weird, so I cancelled, but at least I tried it...which was way out of my comfort zone! I love all of your outfits and am jealous of your music adventures. I worked in a music store during the grunge phase. I had billions of CDs. You lead such a glamorous life AMC! I could definitely join your tribe. We could add "obsession with clip art, borders and digital paper." How could I have forgotten about the clipart and papers!!! I want to be in your tribe too! Loved your post and really cute outfits! The music festival sounds amazing!